Maintained in the realities of fantasy Japanese action MMORPG with arcade combat system. While playing, we play the role of They, whose task is to stop the sinister Kamikui from destroying the world. 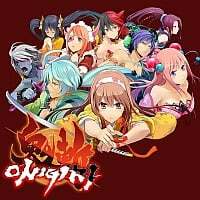 Onigiri is a fantasy MMORPG action, which was released on PS4, PC and XONE platform. The producer and publisher of the game is a Japanese studio CyberStep, having on their account, among others, a series of network fighting GetAmped. Game versions for different hardware platforms do not differ in terms of storyline and gameplay, but they use separate servers: American-Global and European. The Onigiri action was set in a fantastic version of medieval Japan, in which people and mythical monsters, such as devils, they or other yokai coexist. Centuries ago, the terrifying Kamikui flooded the world with a wave of death and destruction, but was eventually defeated by the sun goddess Amaterasu Oomikami, who forced him to retreat with three magic stamps. After many years, one of the seals was destroyed, and over the world hangs the ghost of Kamikui's return. While having fun we play the roles of they, leading a peaceful life on the island of Onigashima. When their peace is disturbed, they decide to stop Kamikui from enslaving the world again. In terms of mechanics we are dealing with a typical Asian action MMORPG, in which player-controlled heroes explore new regions of the world, perform various tasks and defeat their opponents using a highly arcane combat system, known for its hack-and-slash production. They can be accompanied in the mission by up to eight NPCs with different personalities and abilities, which have a different influence on the character of the hero. Contrary to most similar productions, in Onigiri there is no typical class division. When entering the game, players choose one of five features: strength, defense, kindness, courage and caution, which in turn determines the type of weapon it uses. In the course of the game, the heroes gain experience that allows them to develop five basic statistics, i.e. strength, vitality, wisdom, mind and dexterity. Onigiri on PS4, PC and XONE platform is characterized by a relatively average visual setting, which guarantees smooth gameplay. The whole was enriched with a typical for the genre graphic design, in which a slightly manga line dominates, and on the screen appear strongly zoomed out female characters.